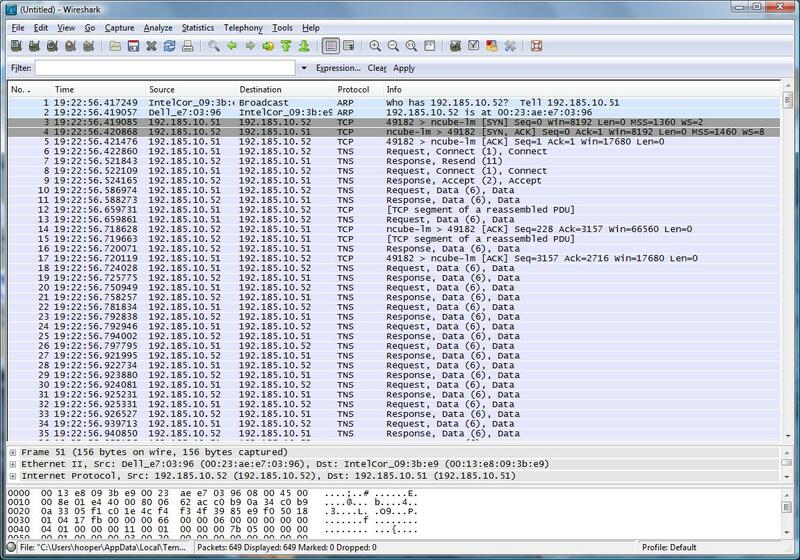 In the previous articles of this series we saw several cases where Wirehark and other utilities helped identify various types of network related problems, and those blog articles provided screen captures that should allow you to identify network patterns that might exist in your own enviroments. The question likely remains: “But (as a DBA) will we ever use this information?” A recent thread on the OTN forums suggests maybe… especially if someone has “optimized” the servers. I contributed several responses in that thread. 1  * * * Tiempo de espera agotado para esta solicitud. 2  * * * Tiempo de espera agotado para esta solicitud. The two timeouts at the start of the output imply that there are two devices, very likely firewalls, that are in the network pathway closest to the computer that executed the command. The times for a response from each hop on the way to the other side of the connection are between 70ms (0.070 seconds) and 100ms (0.100 seconds). The high response times imply that the connection probably is not a T1 or similar high-cost 1Mb/s connection, and the low response times imply that the connection cannot be satellite based where 1000ms (1.000 second) to 2500ms (2.500 seconds) response times would be expected. The original poster confirmed that the connection is a DSL connection – such a connection likely does not have a quality of service guarantee in the event that performance is very slow, or that would take top priority if 95% of the packets are dropped (possibly needing to be retransmitted multiple times). 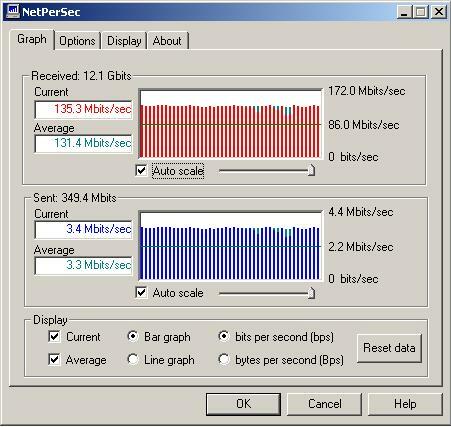 The times reported by trace route are important – if a network packet is sent from the server to the client it will probably require between 0.035 and 0.500 seconds for the packet to reach the client, and an equal amount of time for the ACK confirmation from the client essentially stating that the packet was successfully received and that it is ready for the next set of packets. If you have viewed many TKPROF summaries, or raw 10046 trace files, you would probably recognize that the array fetch size was probably set at 100, and also just how uncommon 5+ second wait are for the “SQL*Net more data to client” wait event. Even though the Oracle Database documentation provides little information about this event, you should be able to recognize that something is very wrong with the 5.13 second maximum wait time. In the opening quote of this blog article the OP mentioned that it required about 5 seconds to transmit 20KB over the WAN connection – could it be that one of these 5 second long “SQL*Net more data to client” waits happened during the transfer, making it appear that the average thoughput was roughly 4KB/s? Immediately after the server sent two packets to the client computer. Immediately after the server sent a single packet to the client computer. Immediately after receiving an ACK packet from the client computer. In the case of the first bullet point, that might tell us that something happened to the client computer or the DSL connection. However, the server should have taken action after 0.2 seconds and attempted to send the packets again. In the case of the second and third bullets, we probably need to look at either what is happening in the server (maybe it took 5 seconds to jump back on the CPU to fetch the next set of rows, but it seems like that would have shown in the TKPROF summary?) or the local network (maybe the switch port dropped out for 5 seconds, but that would have also affected the clients that are local to the server). Someone has been “optimizing” the servers and/or the network. What happens when a switch port is forced to 100Mb/s full duplex without touching the server, which by the way has a gigabit network interface? “Something seems to be very odd here. First, the two sides are connected by a high latency (Internet) connection with many hops, and an average ping time of about 0.1 seconds. You will probably find that the MTU size (consider this to be the maximum packet size before packet fragmentation) when jumping through the various routers is probably about 1500 bytes. If the network administrators have configured the servers and local switch to support jumbo frames (8KB packets, for instance), those jumbo frames will be split into multiple packets so that they are able to pass through the intermediate routers between the server and client computers (you might not see a problem on the server side while one might appear on the client side). You indicate that the time delta between packets is about 0.0001 seconds (0.1ms), which is significantly less than the ping times suggested by the trace route – how many of those packets appear together with a delay of 0.0001 seconds in between? 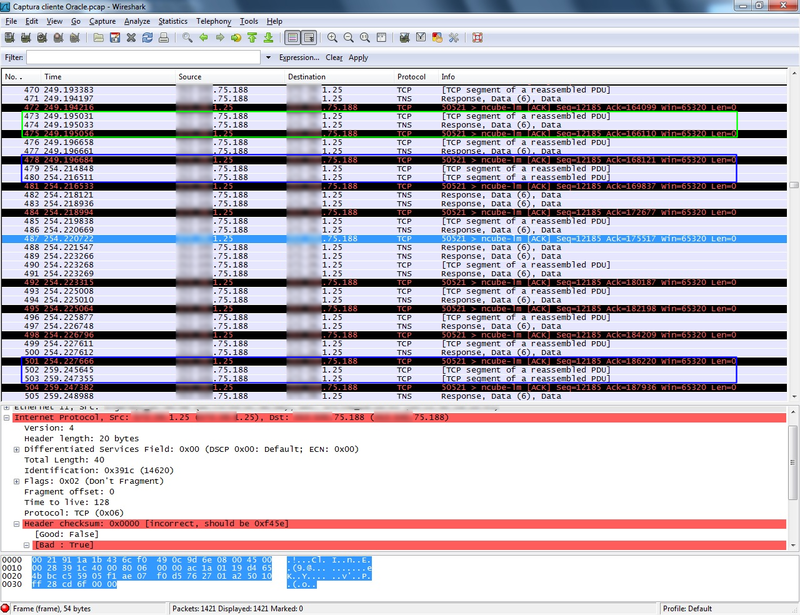 If you have a Nagle/delayed ACK problem where one side is set to send an ACK after 13 (or some other number more than 2) packets while the other side is set to send an ACK after the default of 2 packets, that might, in part, explain the 5 seconds where no packets appeared on the server side of the Wireshark capture (for reference, on a gigabit network, a 130MB file will typically transfer across the network in about 3 second. When a Nagle/delayed ACK problem is present, that same transfer requires roughly 45 minutes). I mentioned falling back to 10Mb/s half duplex, while the other quotes above seem to indicate that the speed will fall back to 100Mb/s half duplex – maybe some of these switches now consider 100Mb/s half duplex as the minimum. Even at 10Mb/s half duplex the speed should be enough to fully saturate the 1Mb/s WAN connection… until we consider latency and the ACK frequency. If it takes an average of 0.9 seconds for the server to see the next request for the next two 1500 byte network packets, that just might slow down the connection a bit. Someone might have the wise idea of configuring the server to send more than two packets, maybe 16, at a time before waiting for the client to send back a single ACK packet. Sounds like a good idea, right? In part three of this series I showed why that might not be such a good idea – especially if only one side of the connection is configured for the modified ACK frequency. That could never happen in a production environment, right? “That screen capture (assuming that it was captured from the server) shows that the server sent 16 packets in rapid fire and then waited. 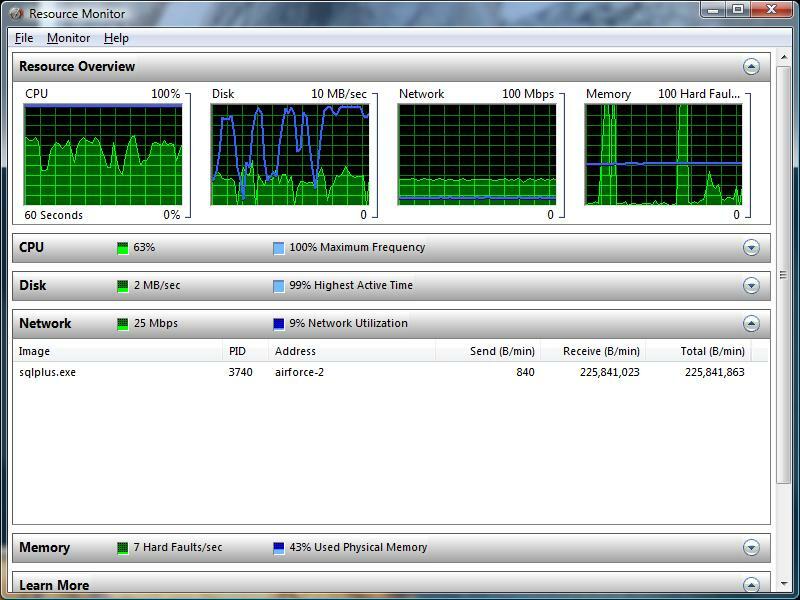 78ms later [indicated by the green boxes in the screen capture] (roughly the ping time that you reported based on the TRACERT output) your server received 8 ACK packets – one for every 2 packets sent by the server (the client side is not configured to ACK after every 8 or 16 packets as the server appears to be configured). 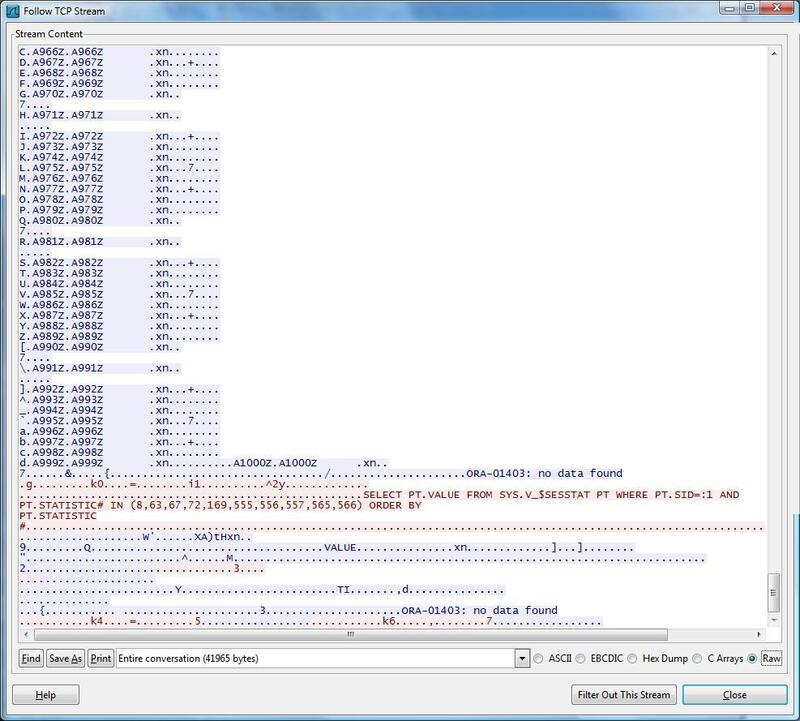 You will see a somewhat similar screen capture here where I “optimized” the ACK frequency on one side of the connection with a large array fetch size. “The header checksum errors are caused by TCP checksum offloading. You will typically receive that message when a better quality network card is installed in the computer – the packet checksum calculation/verification is handled by the CPU in the network card itself, rather than relying on the host computer’s CPU. I think that one of my blog articles mentions this feature. More information may be found here. That is interesting that you periodically see 4 packets arriving with a single ACK packet sent in return – possibly some of the packets were received by the client out of order, so the client had to wait for the expected packet to be received. The typical pattern for a database sending packets seems to be one or more TCP packets with “[TCP segment of a ressembled PDU]” in the info column followed by a single TNS packet with “Response, Data (6), Data” in the info column – that TNS packet seems to marks the end of the array fetch (although I may need to perform additional analysis). Based on some of the tests that I have performed with varying the array fetch size, if you cannot track down why the ACK frequency is wrong, you may be able to work around the issue by setting the array fetch size much smaller. 640MB/12.9 * 18 = 893 seconds = 14.9 minutes to transfer 640MB over a 10Mb/s connection. 640MB / 7mb/s * 8bits = 731.43 seconds = 12.2 minutes to transfer 640MB over a 10Mb/s connection. As I mentioned, this OTN thread is interesting, providing us an opportunity to use some of the tools mentioned in earlier blog articles to try to find a resolution to a particularily troubling problem found in the wild. While the complete cause of the 5 second delay problem has need yet been discovered, it should be an interesting thread to follow. My vote on the cause of the problem is a combination of delayed ACKs due to a configuration change on the server (problem not yet found in the Windows registry), out of order receipt of packets, the server becoming confused at receiving 8 ACK packets when it expected 1, and a couple of network hardware configuration issues (maybe even the use of jumbo packets that are being fragmented) such as having to conform to the 1476 byte MTU of the DSL connection when the network local to the server is configured for a larger MTU size. Just to keep things interesting, the laptop used in the previous article is now connected through an 802.11N wireless connection (gigabit uplink to the server), rather than an 802.11G wireless connection. So, what is the output of the new combined script? Once again, the server is running Oracle Database 11.2.0.1 and the client is a dual core 2.0GHz Core 2 Duo laptop (the client CPU may be a critical factor). At an array fetch size of 10 the client is receiving about 855.35MB, and at an array fetch size of 5,000 the client is receiving about 847.01MB. Let’s contrast the above with the test for table T5. At an array fetch size of 10, for table T5 the client is receiving about 90.13MB (855.35MB for table T6), and at an array fetch size of 5,000 the client is receiving about 81.95MB (847.01MB for table T6). Incidentally, the client’s CPU utilization fluctuated between 50% and 99% utilization, indicating that the client’s dual core CPU may have played a limiting factor in the transfer speed. You must be wondering what kind of an impact the 802.11N wireless had on the overall transfer time. 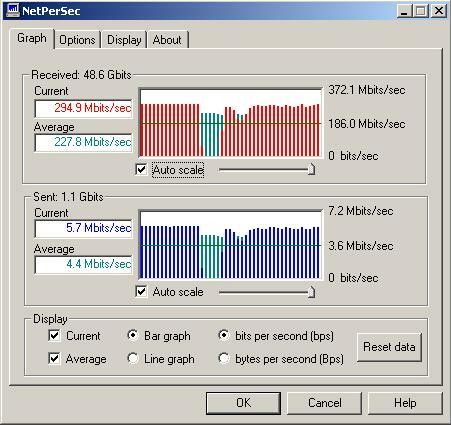 During several of the transfers the Windows Vista Resource Meter indicated that the transfer speed was between 45Mb/s and 48Mb/s with the maximum network transfer capacity indicated as 33% utilized (this upper limit of maximum network transfer capacity did not change when connected to an 802.11G network). 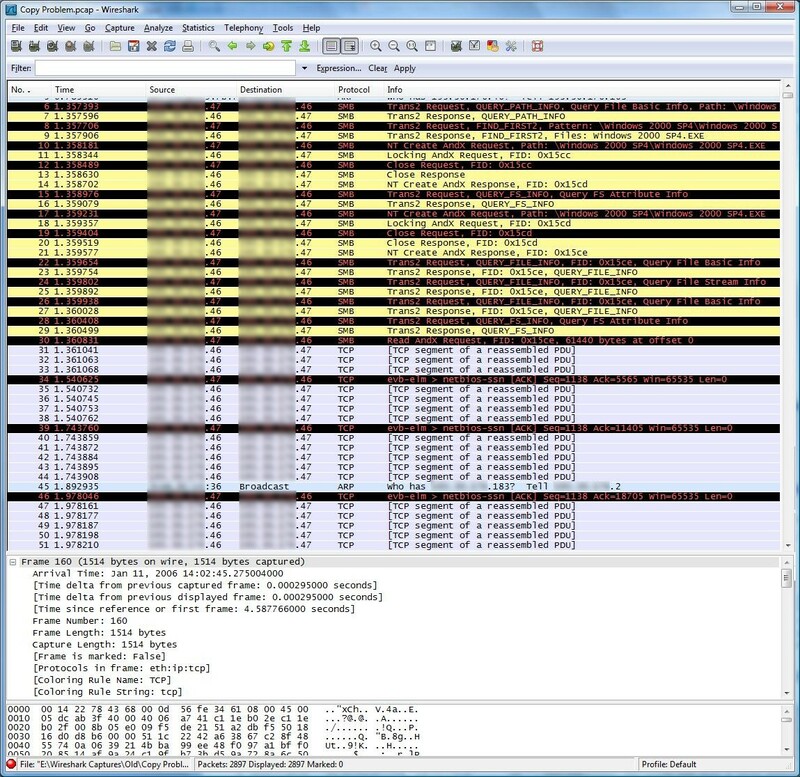 The above output indicates that the lower latency 100Mb/s wired connection did decrease the transfer time so that the transfer of result set from table T6 (no SQL*Net compression) – the array fetch setting of 10 required roughly the same amount of time as the transfer of the result set from table T5 (with SQL*Net compression) when the laptop was connected wirelessly. The CPU utilization of the client also dropped slightly – possibly because the laptop no longer needed to perform the WPA2 encryption/decryption of the network packets (the wireless network is protected by WPA2 encryption). But what about a gigabit connection – would that help? Unfortunately, the laptop does not support gigabit network speeds. With the wired connection topping out at about 83Mb/s to 87Mb/s and the CPU utilization running as high as it was, could we actually achieve a faster transfer speed? To find out, we will switch to a slower desktop computer that is running a 3.8GHz Pentium 4 CPU with hyperthreading enabled. This client, like the server, has a gigabit network card and probably supports CPU offloading of the TCP/IP checksums. So, how well will this second client perform with our test script? The above showed that the gigabit connection helped significantly. The gigabit performance results for table T5 follow. The above shows that the older client computer with the gigabit network card continued to decrease the transfer time up to the array fetch size of 1,000, and then the time increased slightly with the jump to the array fetch size of 5,000. Just how fast was the transfer speed on the slower client computer? 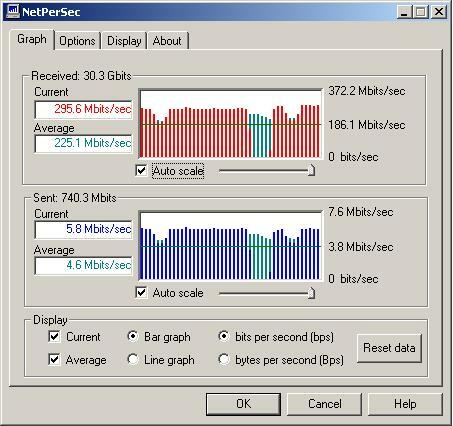 I monitored the performance using a program called NetPerSec which was developed by PC Magazine several years ago. Keep an eye on the right side of the graphs for the current transfer speeds. Will it make any difference if we completely eliminate the network – running the SQL statement directly on the server? Running the test directly on the server had a significant impact on the execution time. While the above tests may have limited value for your specific project, the tests do show the potential impact of SQL*Net compression, the performance impact of different network communication links, and the potential impact the network communication has on the client’s CPU utilization. 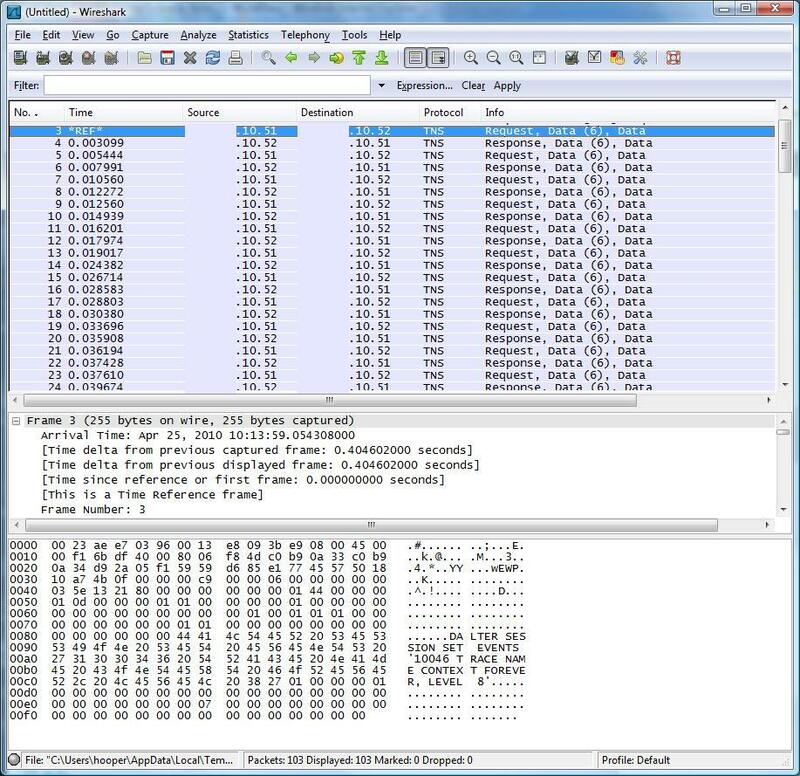 Previous articles in this series showed a lot of interesting capabilities that Wireshark and similar packet capture utilities offer, such as seeing the behind the scenes SQL statements that do not appear in a 10046 trace when Autotrace is enabled in SQL*Plus. But there is more that Wireshark offers to assist with analysis of Oracle data transfers across the network. Today’s article explores some of these additional features while experimenting with different array fetch sizes using Oracle Database 11.2.0.1 with default listener settings on the server side, and Oracle client 11.1.0.7 on the client-side, with an 802.11g wireless network between the two computers (greater network packet latency than a wired connection). The test table and SQL statement used in this article is similar to those used in this article, which demonstrated that the execution plan on Oracle Database 11.2.0.1 differed from that used on earlier releases, and that difference may affect your ability to reproduce the test results for today’s article if you are using an older release of Oracle Database. 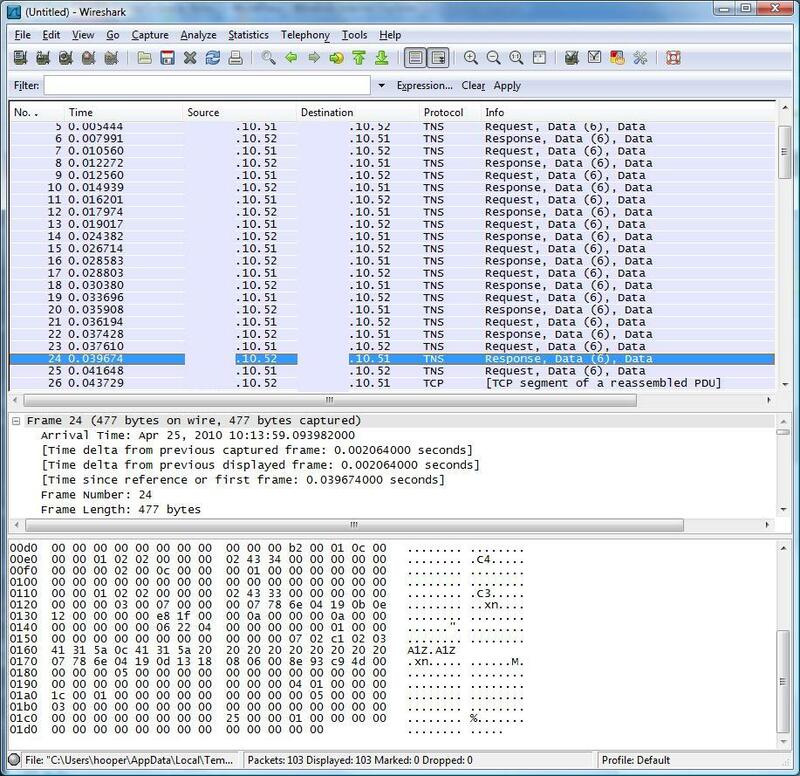 Before enabling the Wireshark capture, execute the test SQL statement a couple of times to limit the potential effects of a cold cache and physical reads unfairly affecting the first execution with the small array fetch size once packet logging is enabled. 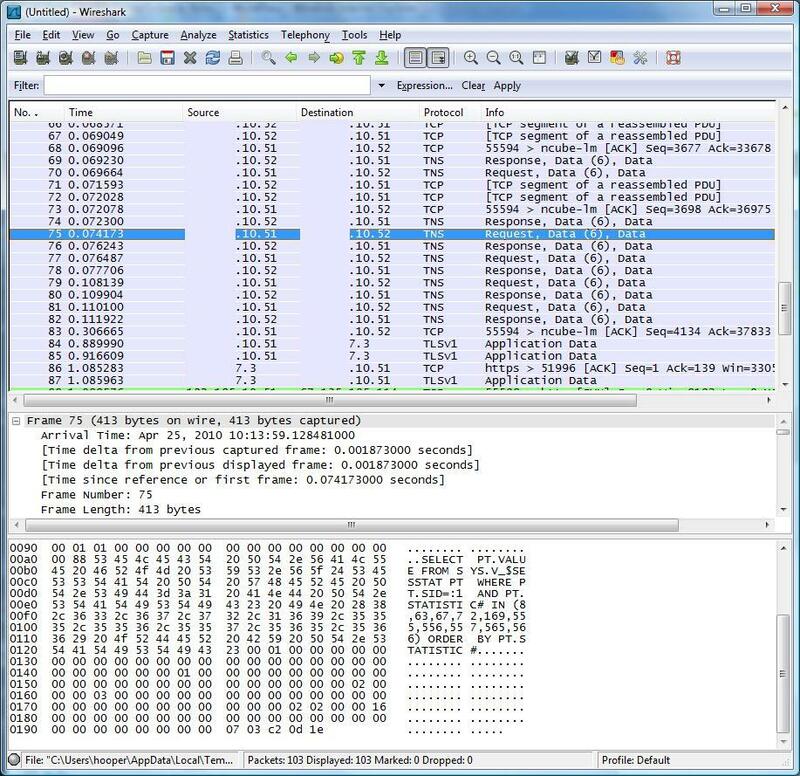 Start the Wireshark capture on the client, and then execute the above test script in SQL*Plus on the client computer. The client will fetch approximately 999,001 rows from the database, and will likely result in a Wireshark packet capture totalling about 600MB. Later processing of the packet capture, as depicted later in this article, will certainly tax the memory limits of 32 bit operating systems, and may result in Wireshark crashing (the latest beta version of Wireshark was used in this test). Additionally, processing of the resulting packet capture is extremely CPU intensive – you have been warned. As shown above, when a line is checked in the lower pane, such as Time delta from previous captured frame, the status bar at the bottom of the window is updated with a field name, in this case frame.time_delta. 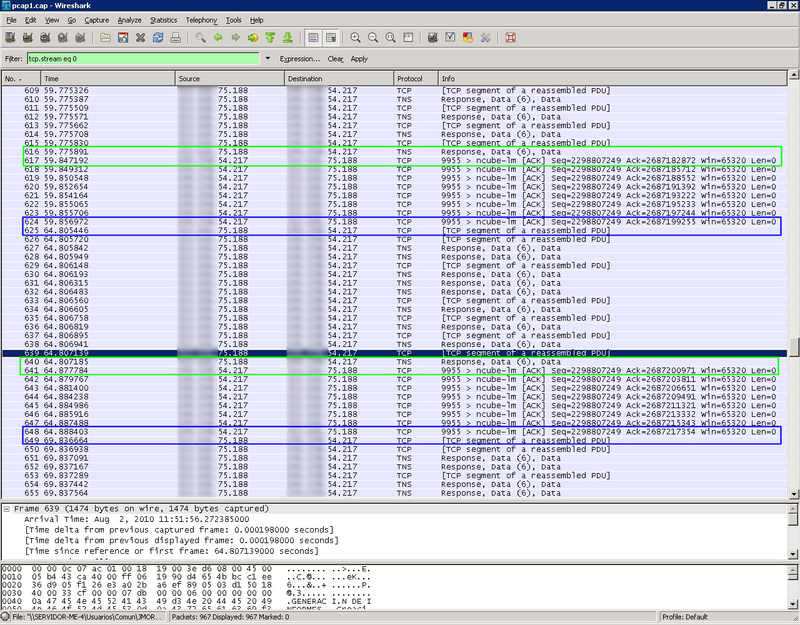 If you manually review the Time column in the Wireshark window you will see that the time delta between packets varies quite a bit. I wonder if the time delta values vary depending on the array fetch size… we could extract the information and process it a spreadsheet package to determine whether the time deltas change. More on this later. The packet frame length for this packet is 704 bytes. 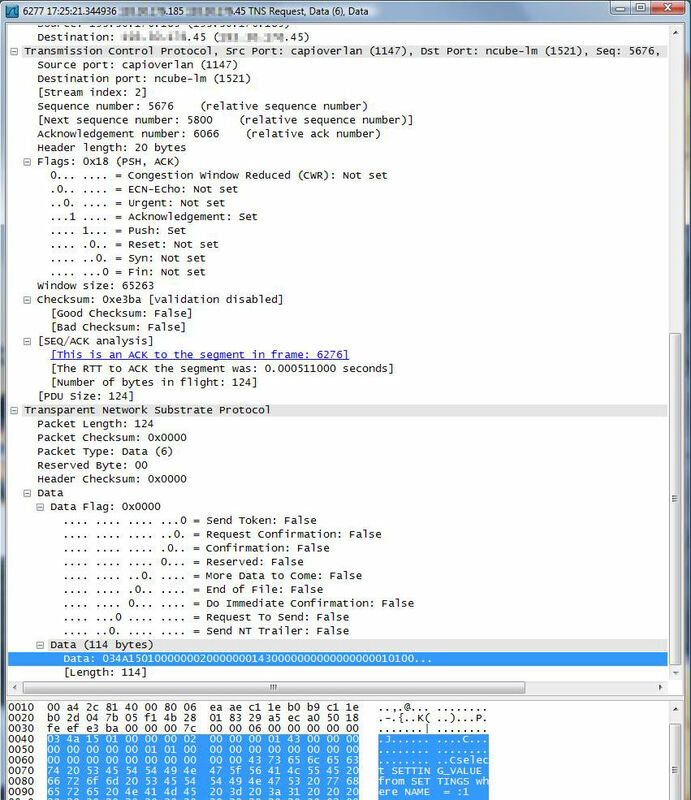 If we scroll down to the bottom of the lower pane, we see that Wireshark has attempted to decode this TNS packet, all except for decrypting the control characters and binary data in the data portion of the packet. We see that the TNS packet length is 650 of the packet frame’s 704 bytes, and the actual data contained in the packet is 640 of those 650 bytes. The status bar shows that the field name for the data length is data.len – we will use this information later. The data section shows that this is the submission of the first SQL statement in our test script. The following screenshot is showing where the server is returning the data to the client early during the execution of the test script. In this case, with the array fetch size set to 10, the server had to break the selected data into two network packets, with the first containing bytes 0 through 1459, and the second containing bytes 1460 through 1760 (just 301 bytes in the second packet). 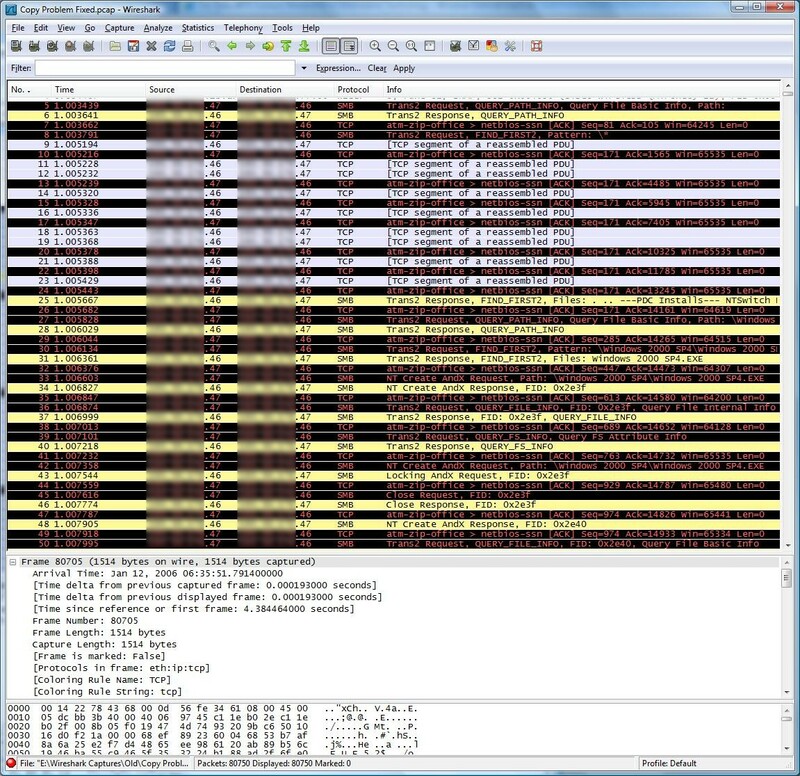 Scrolling down near the end of the packet capture, we see one of the network packets where the array fetch size of 5,000 was in use. The displayed time delta is 0.000341 seconds, which is very good for a wireless network. Moving down to the next packet, we find that this packet is 855 bytes in length, but the total TCP length is 8,155 bytes, compared to the value 1,761 that we found when the array fetch size of 10 was in use. The field name for the reassembled TCP length, as displayed in the status bar, is tcp.reassembled.length – we will use this later. Now for the exciting part, graphing the result. If you had to make a choice of which array fetch size to use: 10, 50, 100, 500, 1000, or 5000, which should you use, and why? 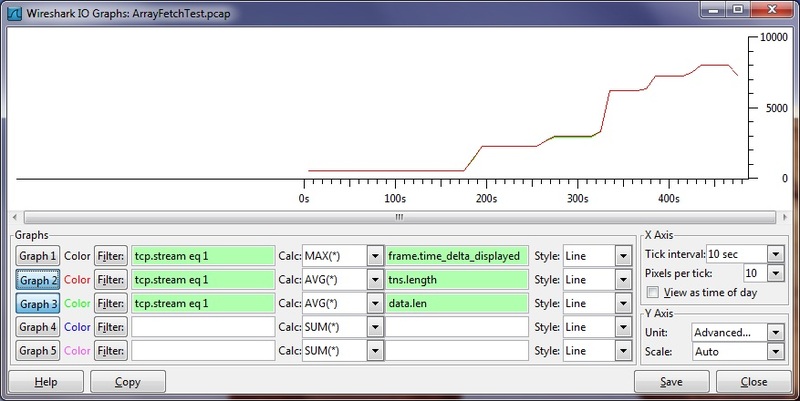 From the Statistics menu in Wireshark, select the IO Graphs menu item. You should see something like this if you set the Tick Interval to 10 seconds and the Pixels per tick to 10. 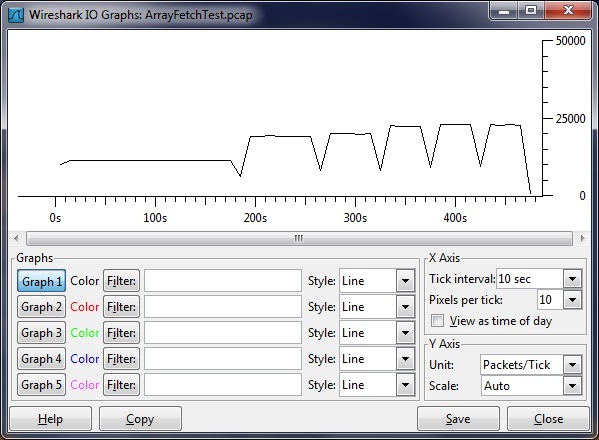 The Tick Interval value determines how the statistics will be grouped together, in this case it is 10 second intervals. The Pixels per tick value determines how horizontally spread out, the distance between the data items when displayed on screen. The first bump width in the values represents the time required to retrieve the data 10 rows at a time. The second bump width represents the time required to retrieve 50 rows at a time. The third bump width represents the time required to retrieve 100 rows at a time. 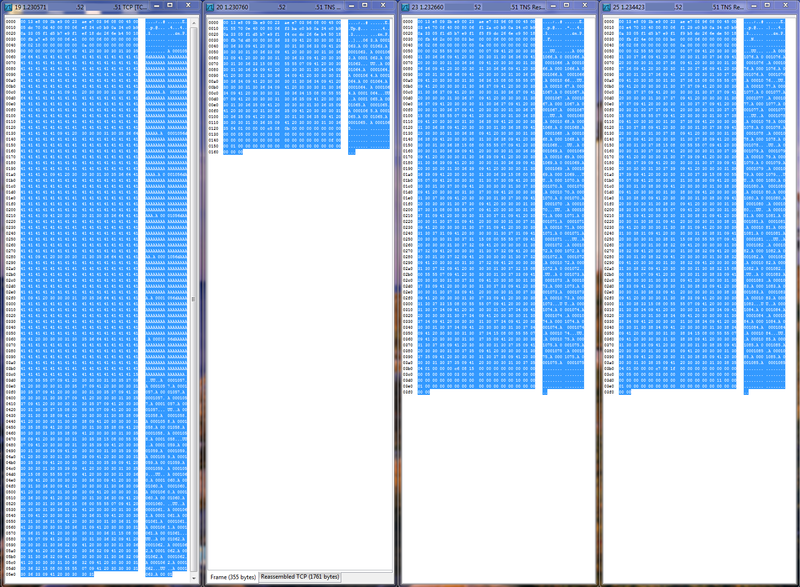 The remaining bump widths show the time required to fetch 500, 1000, and 5000 rows at a time, respectively. The height of the bumps, in this case, indicates the number of packets transmitted between the server and the client in each of the 10 second time intervals. When the client retrieved 10 rows at a time, only about 50% of the number of network packets flowed between the server and client as when the client retrieved 50 or 100 rows at a time – this of course increased the time required to transmit all of the requested rows. By changing Packets/Tick to Bytes/Tick we are able to determine how much data (including overhead) is actually contained in the packets flowing across the network every 10 seconds. While the bumps in the previous screenshot showed that roughly the same number of packets flowed across the network for the array fetch sizes of 50 and 100, this screenshot shows that the amount of usable data (plus overhead) in the packets was about 20% less – this explains why the bump representing the array fetch size of 50 is about 20% longer than the bump representing the array fetch size of 100. Interesting, but why were there only about half as many packets transferred every 10 seconds when the array fetch size was set to 10 compared to when it was set to 50? Did I hear someone say “wait and see”, or was it “latency”? 🙂 If we change the Units field to Advanced we are able to find out what is happening. 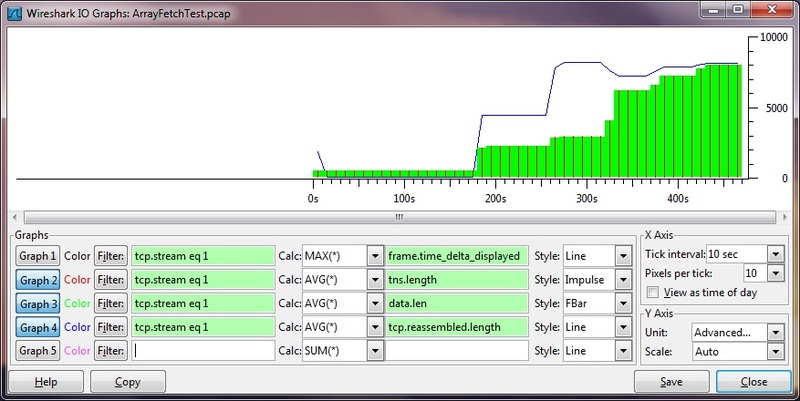 For the Filter of Graph 1 I specified tcp.stream eq 1 (the same filter as was entered automatically when we earlier selected to Follow the TCP Stream). For the Calc entry I selected Max(*) and then in the next field to the right I specified frame.time_delta_displayed – we saw earlier where this field was obtained in the main Wireshark window. I then set the scale to 100000 so that I was able to see both the peaks and valleys in the graph. The graph shows that there is a maximum latency between packets of about 50ms when the array fetch size was set to 10, and that maximum latency dropped significantly until the array fetch size increased to 1,000. With the array fetch size set to 5,000 the maximum latency is nearly identical to that of the maximum latency when the array fetch size was set to 10 – at this point the client is essentially choking on all of the data that it is receiving, it is taking the client roughly 50ms to process the rows and send the next fetch request to the server. Neat, what else are we able to do? This time we will turn off the first graph an create two additional graphs. The first of the additional graphs shows the sum of the sizes of the TNS section of the network packets for each of the 10 second time intervals, while the second of the additional graphs shows the maximum data length in the TNS section – how much actual data is stuffed into the network packets (per the configured Oracle SDU, and may actually be broken into multiple packets). A logarithmic scale is selected for the data since the sum of the TNS section lengths will be considerably larger than the maximum data length in any given 10 second time interval. The green line, representing the amount of actual data in the packets, shows that in a best case scenario, when the array fetch size is set to 10 all of the packets are leaving without being full, or more correctly, the SDU size is lower – so, not only are half as many packets transmitted per second, but in a best case each packet also contains less data. The situation improves a bit when the fetch array size increased to 50, and then stabilized at a higher value when the fetch array size was bumped to 100. The previous graph is somewhat useful, yet at the same time somewhat useless. Rather than looking at the maximum of how full the data packets were in each 10 second time interval, it is probably more useful to look at how full the packets were on average. Well, the following graph does not actually show that – it shows the amount of data Oracle is packaging before transmission, as controlled by the session data unit (SDU) size, which typically has a maximum default value of 8KB. The following modified version of the previous chart shows how the average SDU size of the packets changed as the array fetch size increased. The effective average SDU size doubled as the array fetch size increased from 100 to 500 – does that mean that the transfer completed twice as fast? No, as shown in the previous graphs, but it might have made a greater difference with a gigabit wired network. 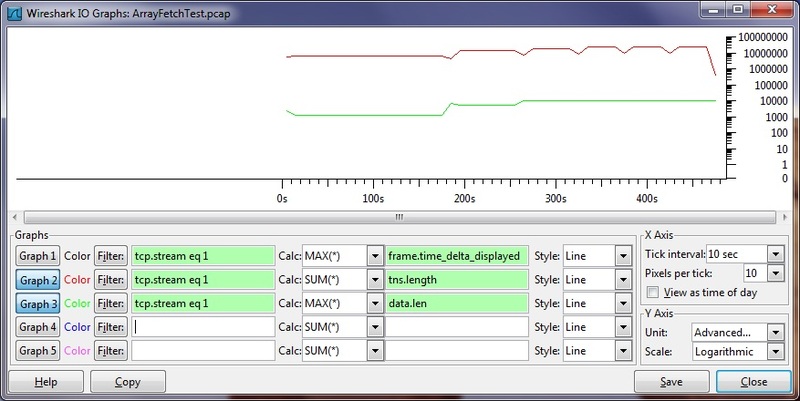 Wireshark also provides the option of controlling the graph type. 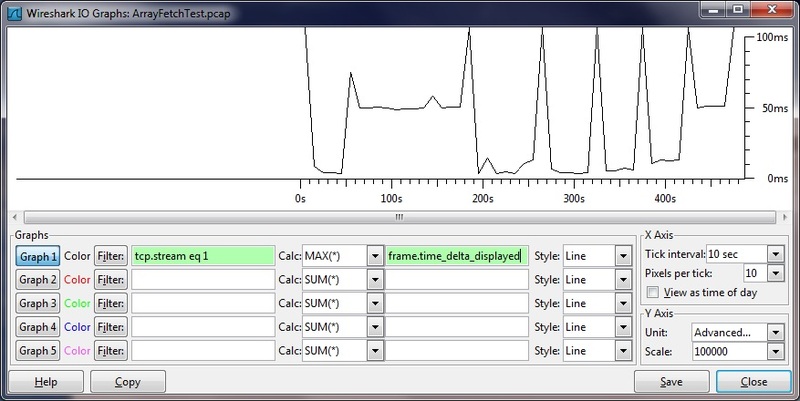 In the following screenshot I added the tcp.reassembled.length as Graph 4, changed Graph 2 to an Impulse style (vertical line) and changed Graph 3 to FBar style (vertical rectangle). Notice that the tcp.reassembled.length values are greater when the array fetch size is 100 than when it is at any other value. I believe that the reason why this is the case is because on average there was a greater percentage of “overhead” bytes in the TNS section of the packets when array fetching 100 rows at a time when compared to array fetching, for example, 500 rows at a time. The 10046 trace file successfully hid how SQL*Plus was able to determine the number of consistent gets, sorts, and various other information for the SQL statement. It must be magic? Or maybe something else is happening… such as the creation of a secondary session to retrieve the statistics. 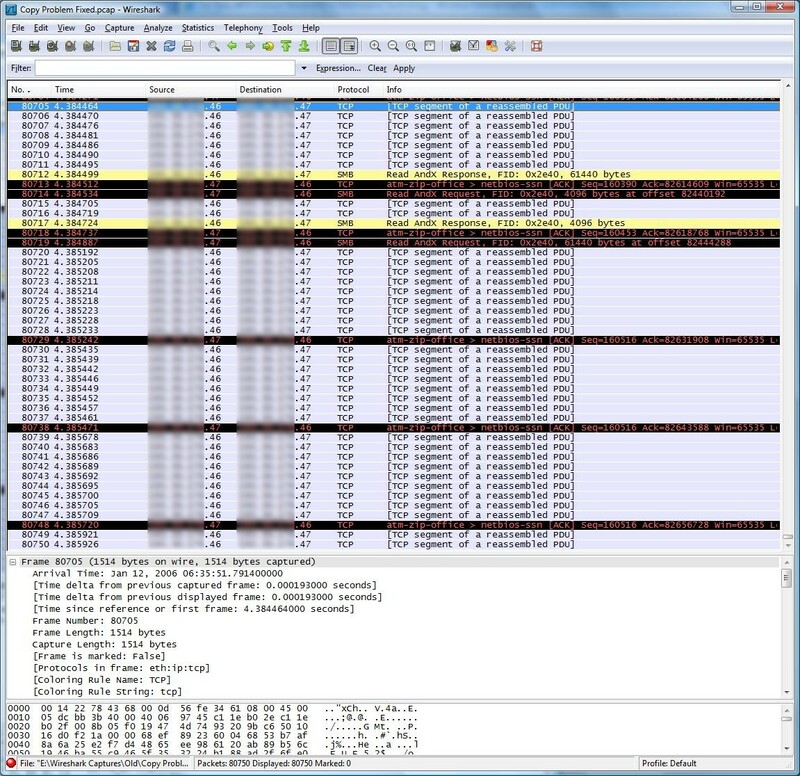 Maybe Wireshark is able to help answer the question (note that some information in the Wireshark output is obscured – possibly you would not want someone seeing that information, or for that matter any of this “clear text” information, which would be clearly visible to all computers on a wireless network, as well as on networks that utilize hubs rather than switches, if the Oracle Advanced Security Option is not purchased and enabled). Packet 24 shows the retrieval of the first row from the database, on the lines between bytes 0150 (336 in decimal) and 0170 (368 in decimal). Packet 25 contains the request for the next set of 100 rows, and packet 26 begins the transmission of those 100 rows. 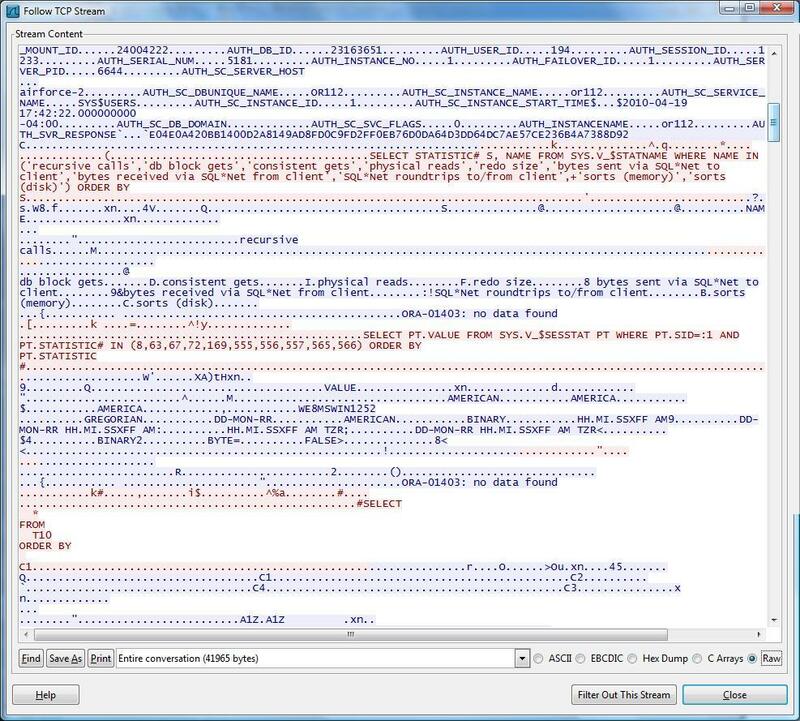 Packet 75 shows another SQL statement that was not explicitly included in the test script – this SQL statement also was not included in the 10046 trace file. The SQL statement retrieves the ending statistics for the session, allowing SQL*Plus to display the output of the delta values for those statistics. 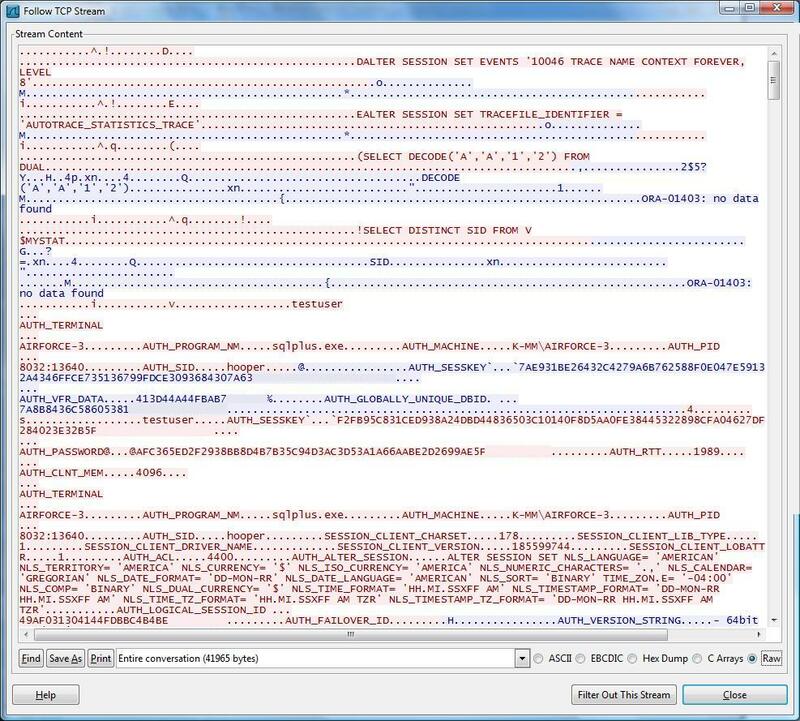 One of the problems when reviewing the packet trace output, of course, is that it is difficult to see the full picture of what is happening. 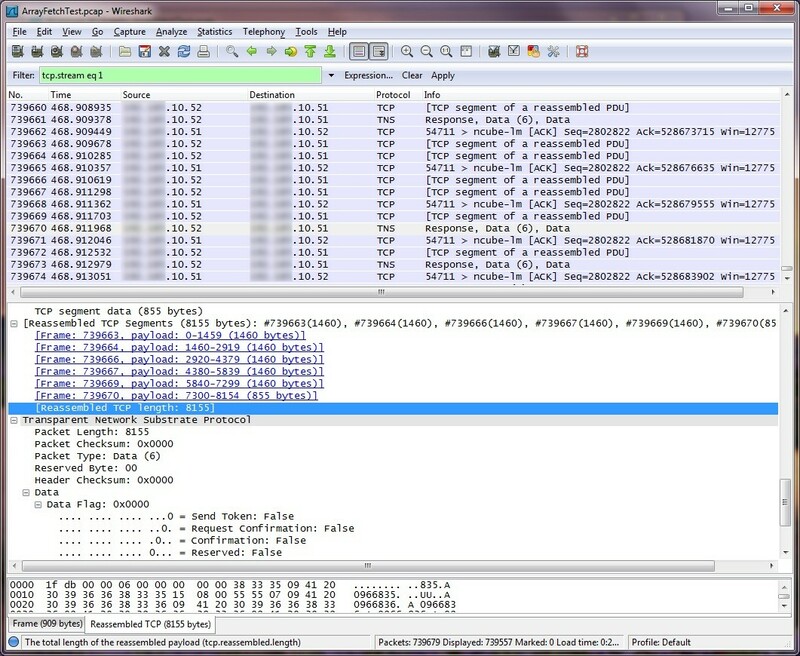 Wireshark allows right-clicking one of the packets in the conversation and then offers the option of Follow TCP Stream. For example, this is the Follow TCP Stream output at the start of the test script execution, with the red colored text showing the client-side transmitted data and the blue colored text showing the server transmitted data. Scrolling down a little further we see the SQL statement used to determine the STATISTIC# values, followed by the SQL statement that was executed in the secondary session which determined the current statistic values for the session of interest. There were a lot of . (period) characters in the Raw output, designating unprintable characters. Might some of these unprintable characters be the missing number column, the missing date column, or various control characters? 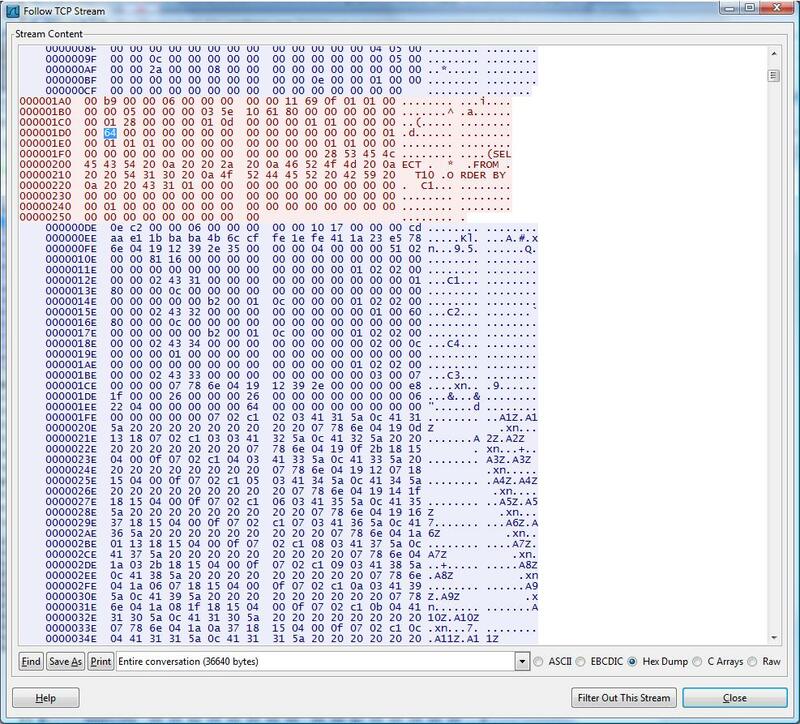 Switching to the Hex Dump view might be helpful. In the below picture we see the SQL statement from our script, followed by a single row returned from the database, followed by another fetch call from the client, followed by the next 100 rows from the database. 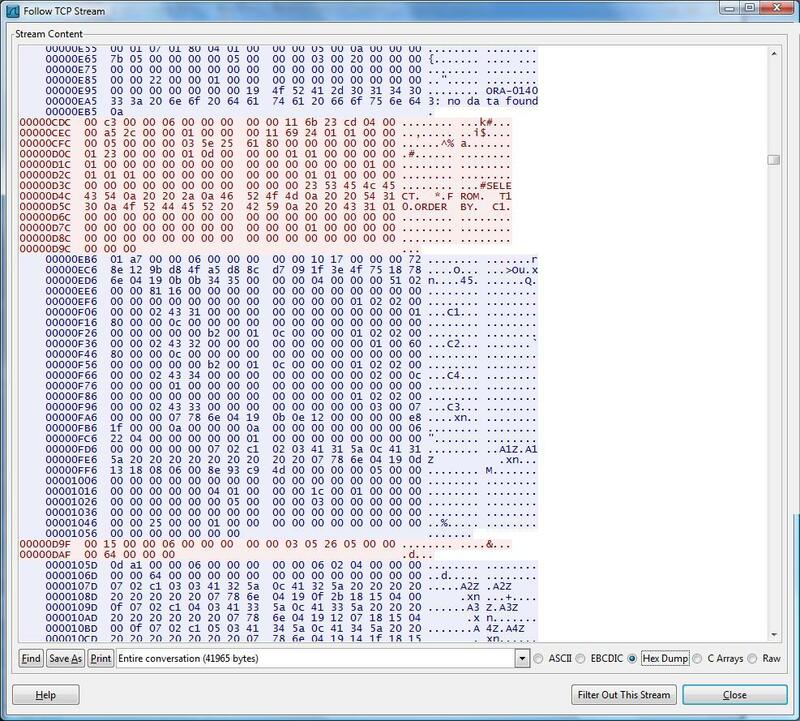 I saved the Hex Dump output from Wireshark’s follow stream to a file: NetworkMonitoringExperimentations4-FetchSize.txt (save with a .txt extension). Feel free to confirm that the array fetch size is provided in that byte location. The byte containing the array size indicator seems to be incorrect when the fetch array size is set to 500 – F4 is equivalent to the decimal number 244. True, but F401, or with the high byte first, 01F4 is equivalent to the decimal number 500. As a late edition to this blog article, I submitted the same SQL statement using a client that is able to retrieve the full fetch array size of 100 in the first fetch call. Below is the packet capture for that execution – compare the packet capture with the last of the above pictures to see if you are able to determine where SQL*Plus specified that the array fetch size for the first fetch should be only 1, rather than the user specified 100. 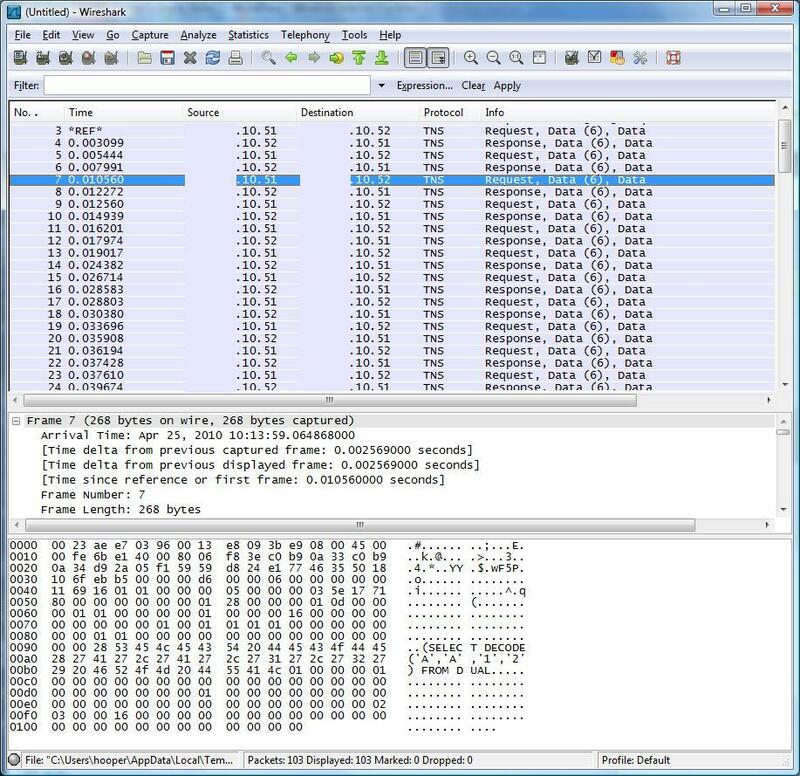 A search through YouTube locates a number of helpful Wireshark videos, including this one that shows how to use the Follow Stream feature. So, the question remains, how do we decode the rest of the conversation between the client and server? For instance, what happened to the number and date column values in the packet capture? Does this OTN tread provide a clue? 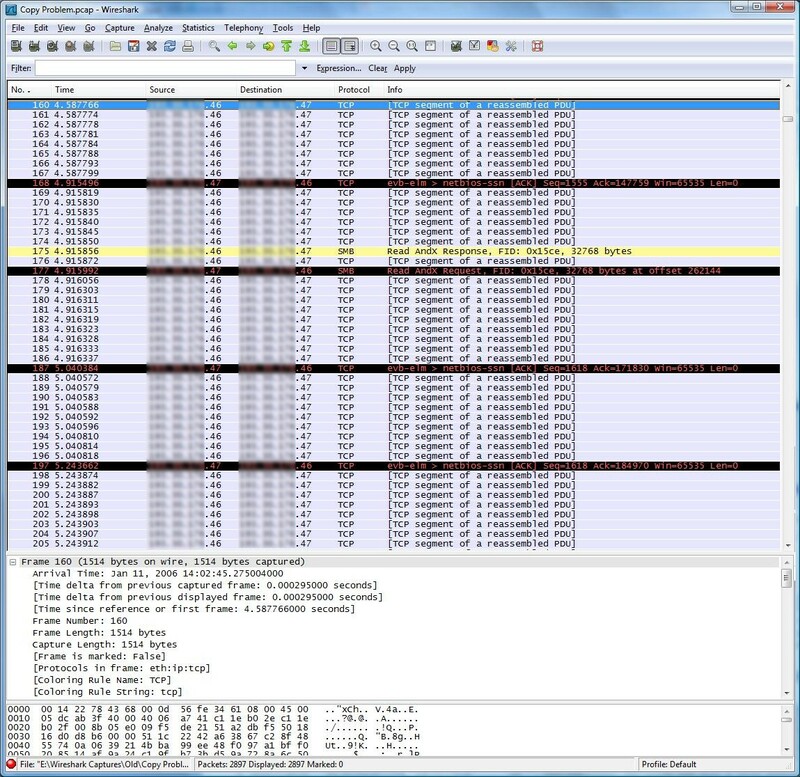 The first post in this series introduced Wireshark, demonstrated some of the problems that may be detected with the tool, demonstrated what happens with various fetch array sizes in the presence of configuration problems, and compared a low latency 100Mb connection with a higher latency wireless 802.11G (54Mb) connection from the same client computer during a transfer of database table data. The connection attempt shown in the screen capture from the previous post was of the computer connecting through the wireless connection to a server during the launch of an ERP package. That connection attempt was slowed a bit by the network latency. That screen shot is shown below. In the above we see the client computer searching the file server for a file named DNSAPI.dll that did not exist. Then we see a DNS lookup attempt for a device named TNS.k-mm.com (for those following along, this was caused by the TNS: keyword on the remotedbname= entry in the SQL.INI file). Notice that the timestamp of the request is at 17:25:14.683144. When the client is told by the DNS server for the second time that the name does not exist, the timestamp has advanced to 17:25:14.686069. Next, the client tried to resolve the name TNS first by a direct WINS (NBNS) lookup and then by a WINS broadcast. 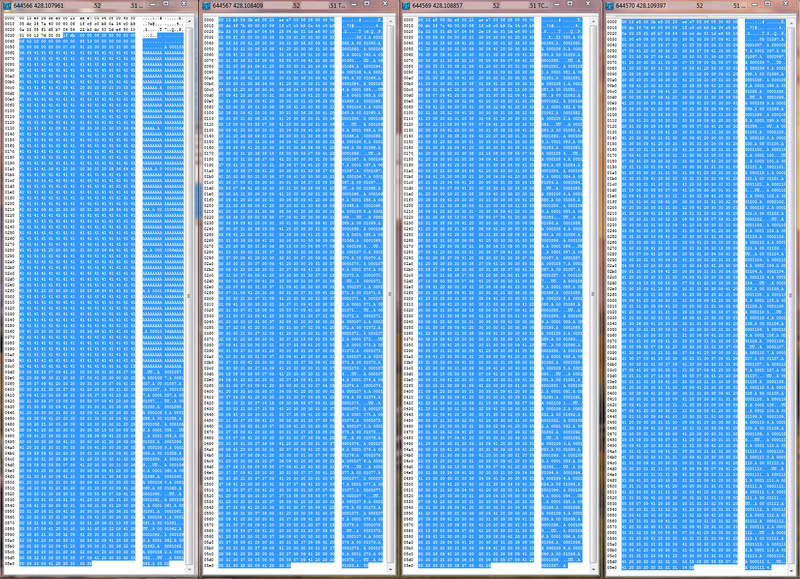 The timestamp of the next client activity after the WINS lookup is 17:25:16.967553, so roughly 2.3 seconds were wasted. But, that is not the most significant lost time interval. The above shows the actual connection starting at 17:25:16.988701 and completing at 17:25:17.001425, which is very quick, but are we done yet? The above screen shot shows the client looking for a file named nethasp.ini on the file server, but is not able to find that file. Important? The above shows that the client finally gave up looking for the nethasp.ini file at 17:25:17:209969, and at 17:25:17:232671 started sending a series of four full broadcast packets, spaced roughly one second apart, to a destination port number that Wireshark has aliased as tcpnethaspsrv. The client finally started communicating again with the database server at 17:25:21.344038. 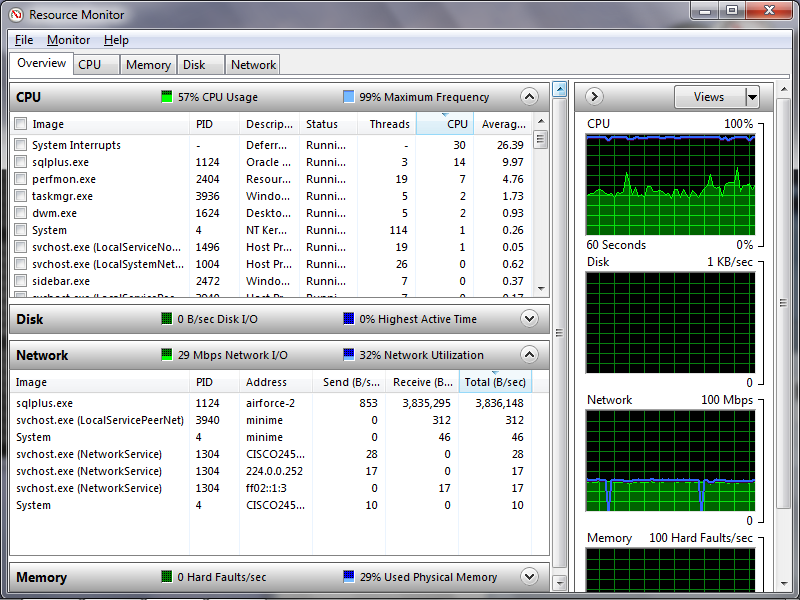 So, between 17:25:14.686069 and 17:25:21.344038 the client mostly just sat idle waiting for a response that never came. Yes, Wireshark ultimately identified the cause of the problem and helped find a course of action that was fully in place at 05:30:00 the next morning, with the new version of the ERP program starting in less than a second just like the old version. Notice that the raw packet data appears at the bottom and is expanded into human readable text in the upper pane. Clicking a line in the upper pane (for instance one that shows the destination MAC address) shows that information in the raw packet data at the bottom of the window. The problems might include client computers with 100Mb network cards connected into gigabit switches, which then results in unexpected packet retransmits until the client computer is moved to a 100Mb switch that then connects to the gigabit switch (this is a rare problem, somewhere I have a Wireshark capture that shows this behavior). The problems might include failing network equipment or bad network wiring or excessive EMF in the environment that distorts traffic on CAT 5e, CAT 6, and wireless connections. The problems might include a client application that unexpectedly takes 10 to 20 seconds to “log in” when it should take 1 second or less. The problems might include issues with inappropriate fetch array sizes, poor choices for SDU size, forcing jumbo TCP/IP frames through intermediate network hardware that does not support frame sizes larger than roughly 1500 bytes. The problems might include a high latency network or WAN connections. There is nothing terribly out of the ordinary with the above. 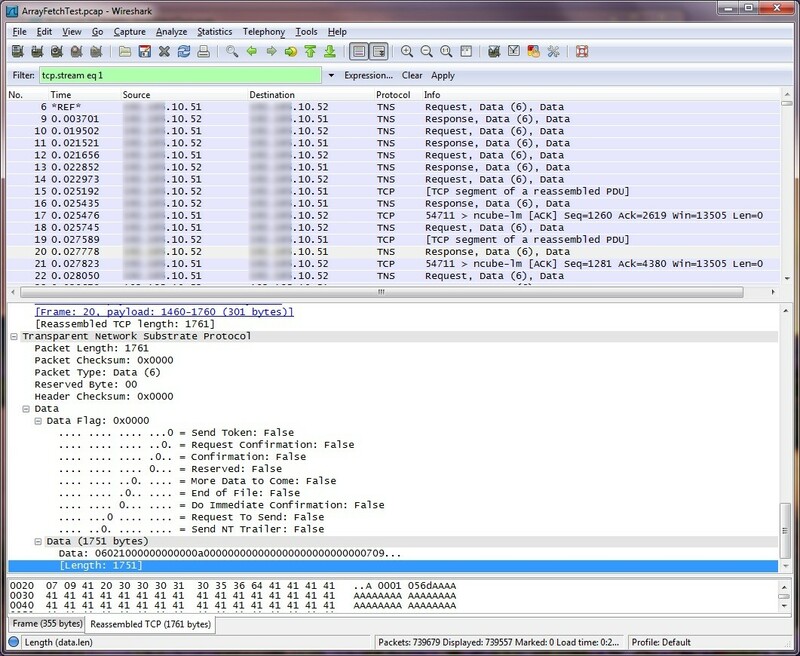 The client computer in packet 1 sent an ARP broadcast packet to the network asking for the MAC address of the network card on the network that is associated with IP address 192.185.10.52, and the response should be returned to the client computer at IP address 192.185.10.51. Roughly 0.002 seconds later the client computer attempted to connect to the database server using the TNS protocol. Roughly 0.1 seconds later the connection completed. Roughly 0.06 seconds after the connection attempt finished, the client computer started sending queries to the database server. There were a couple of delays between the submission of the SQL statement and the response from the server, such as the 0.12 second delay between packet 26 and 27, but nothing significant. In the above, notice that the server (IP address 192.185.10.52) is resending packets that it assumed were lost in transit due to the long delays between packets without receiving an ACK from the client computer (the ACK packet may have been lost). Notice also the long delays between packets that might either be a symptom of network problems, or CPU/Wait Event that could be captured in a 10046 extended SQL trace. 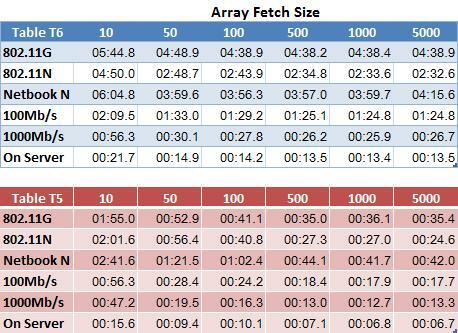 Next, let’s take a look at the effects of adjusting the fetch array size (number of rows retrieved in each fetch call – ARRAYSIZE setting in SQL*Plus) when executing a SQL statement in SQL*Plus that selects from a table having an average row length of 245 bytes, with the client on a wired 100Mb connection, and with the standard Oracle SDU size. The server is still at IP address 192.185.10.52, the client computer (same as used above) is now at IP address 192.185.10.53. In the above, you might notice that after every two packets that are sent by the server, the client computer sends back an ACK packet – this is typical behavior. So, what happens when someone “optimizes” the network card parameters?